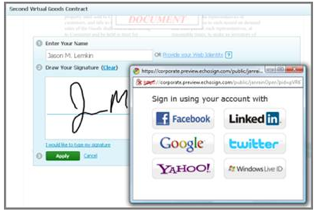 EchoSign, the web-based electronic signatures and signature automation service, is launching new functionality today that allows users to use their web identities (Facebook, LinkedIn, Google) to e-sign contracts or other documents. The web identity feature is designed to help provide an easy way to confirm identity in a transaction and help you tie their social graph to you e-signatures. Your social graph is automatically captured by EchoSign and attached to PDF copies of every signed contract, along with your email address, IP address, signature image, and chronological transaction history. While there’s no extra cost to use EchoSign web identity, you can also disable the feature. EchoSign, launched back in 2006, has reached 2.2 million users, up from 1.2 million users earlier this year.